12-Ants - 12-Ants or more for your desktop. 12-Ants or more for your desktop. Itching is not excluded. Watching the little rascals and have fun. 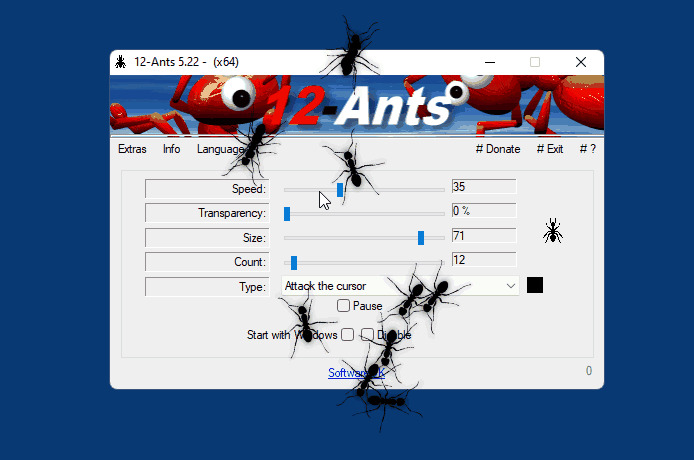 12-Ants does not have to be installed and can be executed easily from the desktop, and can be carried on a small usb-stick or other memory device. New in: 1.44 // 20 Oct 2010 New in: 1.42 // 18 Sep 2010 Reviewing the program and recompiling 12-Ants, because virus alert from some virus scanners, although no virus was present. In any case, this message is no longer present (at 1.42.1). 1.41 // 26 May 2010 Bug fix in 12-Ants: 1. Unintended Start with Windows. 2. Correction of flicker in drawing, when the program is started in Windows 7 and Vista.